Sharp “chink.” Song is series of high “see-weet” notes followed by a lower short trill. Description: Sexes similar. 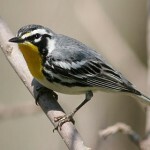 Olive green above with a gray head; bold white eye ring; yellow throat and underparts; whitish patch on lower belly not always obvious; yellow undertail coverts. Reddish crown patch seldom visible in the field. 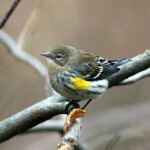 Female is slightly duller than the male. No wing bars. Habitat: Second-growth woodlands having a brushy understory. Forages in tall weeds, shrubs, and low trees. 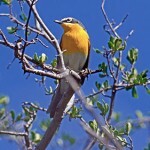 Where in Nebraska: Common spring and fall migrant across the state, perhaps becoming less common westwardly. Once thought to nest in the Missouri River valley, but this now appears to be erroneous. 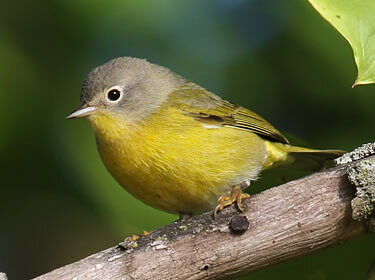 Fun Facts: The Nashville Warbler’s will sometimes use porcupine quills as nest material.